On the 12th of this month, Maruti Suzuki India is bringing its multi purpose vehicle Eritga to the automobile market of India. The design of this vehicle has been done keeping in mind the specific requirements and the average size of the large Indian families and their lifestyle. The Maruti Suzuki Eritga will come loaded with six different variants under its line-up. Three of these will be petrol and the rest three will be diesel.Thus the customers will be having equal volume of choices to select their pick. These six variants are LXi, LDi, VXi, VDi, ZXi and ZDi. Amongst these, the Ertiga ZDi which is the high end variant of the diesel version of Ertigahas been priced at approximately Rs 9.40 lakh (ex-showroom price Mumbai). Meanwhile the price by which this line-up is going to be selling in the Indian automobile starts from Rs 6.5 lakh. It is necessary to clear the doubts about the engine options available for the Maruti Suzuki Ertiga line-up.These cars have 1.4 liter K series petrol fuel engine and 1.3 liter diesel fuel engine beneath the bonnet. The overall length of the car is only some centimeters more than the prescribed 4 meter limit.So as per speculations, it may enjoy the similar tax benefits as that of the small cars, and the height of the car is proportionate to an average Indian citizen’s height. The car has a good looking multi-utility central consol while the interiors have been kept simple with an abundantly rich feeling that instantly comes when one enters the beige themed cabin of the car. The exterior of the car is very simple; this makes it look more beautiful in its simplicity without any lavish looking graphic work on the exterior. The delivery of this model has already started to the dealerships across the nation from the last week of March and till now it has dispatched a good volume of 1,117 units without any glitch. But with a taste left in the mouth of the customers and those people who drove the demo cars of Ertiga, the waiting period could be a bit longer than usual, although the dealers have started taking the bookings of Ertiga in India. 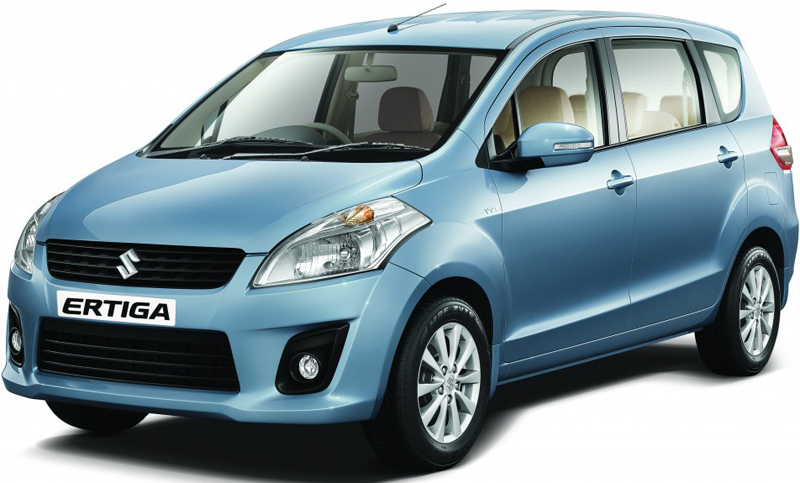 But with the rising price of petrol fuel, the diesel variants of Ertiga may rule over its petrol counterparts. Moreover, Ertiga is coming out from the number one car maker of the nation, which already made its success half sure even before even launching the vehicle for the Indian roads. The price may be a bit higher, but with the after sale service back-up through its humongous network of service stations, it all makes worth the money spent on buying it.